There are ten stories and two dozen characters that fill Short Cuts, and a plenum of human melodrama, drama, and darkness that fill the screen: joy, sadness, jealousy, fear, reconciliation, pain, infidelity, and death-accidental, murder, and suicide are among them.To reproduce the episodic and multi-narrative entanglement would be an unproductive exercise here. In a nutshell, it is a modern-day angst movie, with people misunderstanding, begrudging, beguiling, disappointing -- and even killing -- one another. In a work this pervasive, some plots will be inevitably weaker than others. 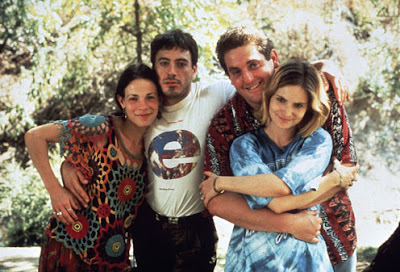 But the overall feeling is that Altman, maker of Nashville and The Player, has pulled off another ensemble coup, with commendable assistance from Lily Tomlin, Tim Robbins, Jennifer Jason Leigh, Tom Waits, Bruce Davison, Fred Ward, Robert Downey Jr. and many others. Altman's movie is a harsh, almost fatalistic overview of modern-day sufferings in the less-exotic suburbs of California. After all the various plots have been introduced, developments (usually negative) cause many of them to intersect. The unfolding of events between Ward and wife Anne Archer who are invited to dinner for the first time with bickering spouses Julianne Moore and Modine is utterly mesmerizing. You watch enrapt, as these people experience the unrelenting tragicomedy of being alive. Although the omniscient design of Short Cuts is enthralling, it's indistinct. That indistinction leads us to believe we are watching something telling and profound. 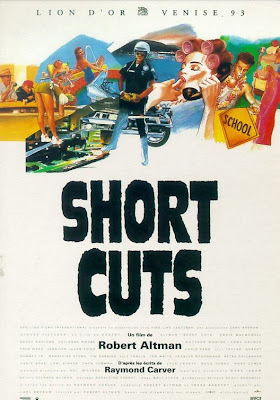 Short Cuts is a film almost wholly devoted to the written word, as all great films are, but its ‘little above average’ goodness, rather than greatness, stems from the fact that the words of Carver-as hit and miss in prose as Altman is on film, are never allowed their full power nor poesy.